SMELL PROOF TECHNOLOGY LOCKS IN ALL SCENTS & SMELLS - Have full confidence knowing the HG Bags contain all smells while keeping your goods fresh! STORES UP TO 1 OUNCE OF HERBS, SPICES, TEAS & DRIED FOODS - The 7x6 inch bag is the ultimate storage and travel bag! Small, compact and light enough for easy travel! Holds Half oz to 1 oz and Keeps Goods Fresh! The Herb Guard Smell Proof Bag is a compact 7 inch by 6 inch bag that holds all of your favorite goods with complete smell proof protection. A discreet and stylish bag, designed with you in mind. 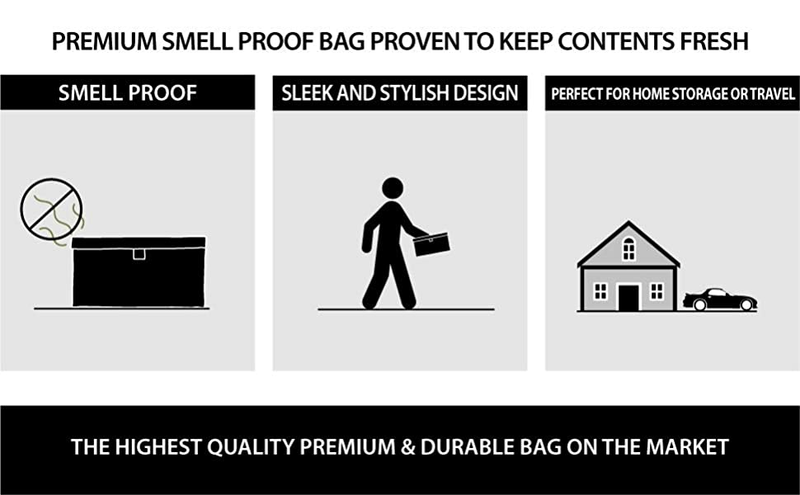 The HG Smell Proof Pouch comes equipped with 2 smell proof, resealable and reuseable travel bags. The bags keep your goods separate and organized inside the pouch and isolate your consumable goods from other items you store in the bag.